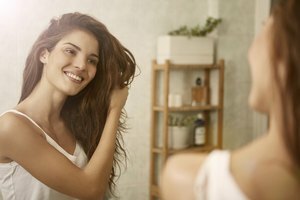 Fine and frizzy hair has the potential to transform into a gorgeous, flowing mane—with the right haircut and styling products. If you don’t have thick, straight hair that behaves on command, here's how to choose the most flattering cut. Layering fine hair is a great way to add style and volume. Try an adorable chin-length bob with lots of jagged edges framing the face. Keep the bangs to the cheekbone or longer. Use styling serum specially formulated for fine hair to add body and shine. Add a quarter-sized amount to wet hair. Blow-dry with your head turned upside down. Roll your layers around a medium-sized round brush and dry each section. Once dry, tease the crown of your hair and flip your head upside down. Rub a dime-sized amount of hair gel in your palms and run your hands through your hair. Flip hair right side up and fix the teased crown into place with your fingers. Run your fingers through your tresses and apply a light misting of hairspray all over. Shoulder-length hair with medium and long layers works great for curly hair in need of frizz control. Keep bangs long with layers as well. Use curl-enhancing styling gel. Add a quarter-sized amount to wet hair and let it air dry. If you don’t have time to air dry, attach a diffuser to the hair dyer and scrunch sections of hair while drying. Finish with a light spritz of gel mist and give hair a final scrunch. Keep frizz in check with a good haircut every six to eight weeks to eliminate damaged and dead ends. If your hair is extremely frizzy and thick, ask the stylist to using thinning scissors. If you've got a double whammy of fine and frizzy hair, go for a shoulder-length cut with medium and long layers throughout the hair and bangs. Style your hair with frizz-reducing hair gel. Use a dime-sized amount on wet hair. Blow-dry using a large round brush. Wind your layers around the brush and dry your hair in sections; remove the brush from each section by unrolling and pulling up and outward to create body and to smooth frizz. Finish with frizz-control styling gel mist.